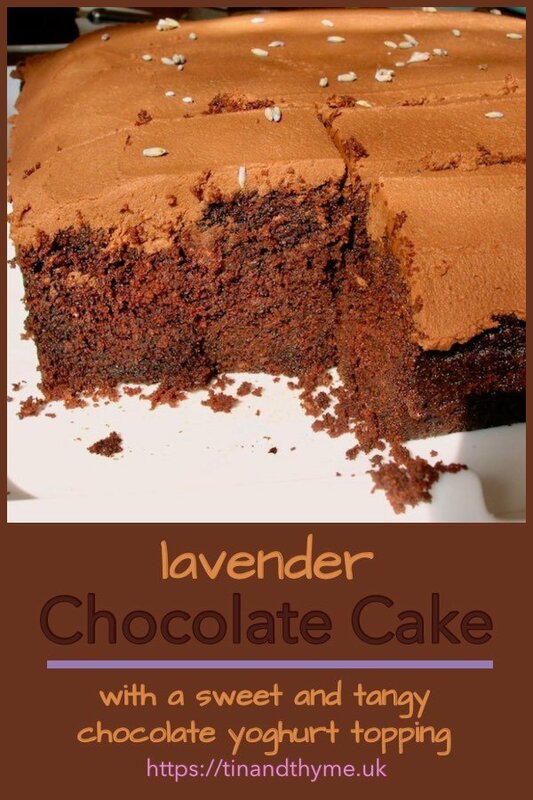 This deep and luscious chocolate lavender cake is perfect for feeding a crowd. It’s light in texture, has a subtle floral tone and keeps its shape well when cut into pieces. The icing on the cake is a delicious and tangy one. It’s made with chocolate and yoghurt. I’ve been trying to organise a herbal medicine course for some considerable time now. It’s been touch and go, but it looks as though it will be going ahead tomorrow – crosses fingers and toes. The original date was back in January, but it had to be cancelled as the medical herbalist was ill. It’s a day course and for lunch we are all bringing food to share, so of course I’m bringing cake! 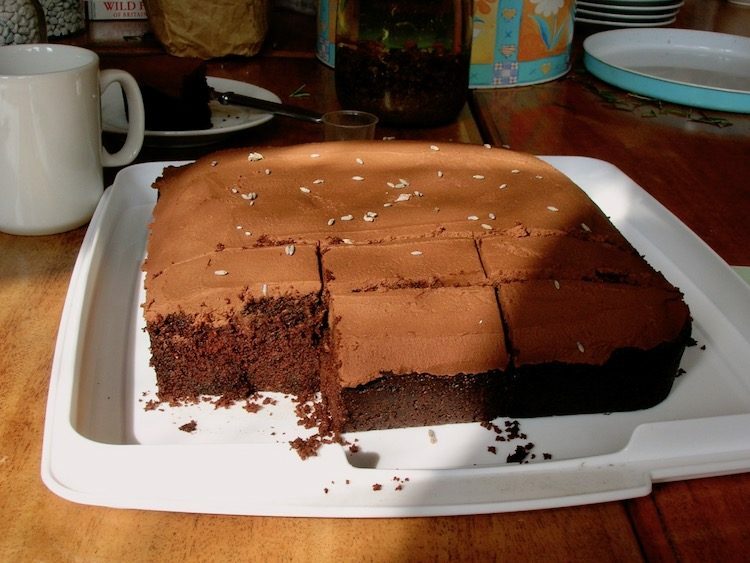 A while back, I spotted this chocolate slab cake over at Celia’s wonderful blog, Fig Jam & Lime Cordial. It looked to be just the thing for feeding a crowd, although I’m not sure 14 of us really constituted a crowd. A Forkful of Spaghetti wondered if I was making a herbal cake, given I was going on a herbal course. Now why didn’t I think of that? As soon as she asked the question, I knew immediately I would use lavender. I’ve been wanting to make a cake using lavender for ages, but haven’t yet found the opportunity – until now. All I really needed to do, was to substitute lavender for the vanilla extract stated in the original recipe. And naturally I made a few other adjustments whilst I was at it. The course did indeed go ahead, which was lucky in view of this rather large slab cake of Celia’s I’d made! It went down a storm amongst the course participants – the course and the cake. The lavender touch was appreciated too. Not having used lavender before in baking I was a little concerned the flavour might be either overwhelming or obscured by the chocolate. But oh, I managed to get it just right. Everyone could taste the lavender, but it was by no means overpowering. The cake rose well. It was light and moist but also firm enough so that, when cut, the pieces stayed together. The cake was topped off nicely by the tangy chocolate and yoghurt icing. All agreed this was completely delicious and it demonstrated that lavender has culinary as well as medical applications. 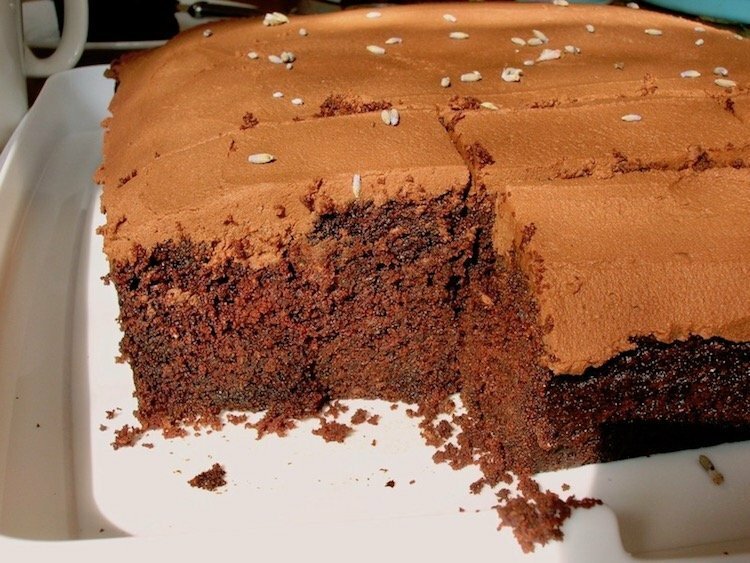 If ever a chocolate cake was needed to feed a crowd, this has to be the one. The only thing I’d have done differently, if I’d had the option, was to use a deeper cake tin. I didn’t have one. Luckily the chocolate lavender cake rose just enough not to spill out over the sides of my 9″ sq silicone mould. Thanks for visiting Tin and Thyme. If you make this luscious chocolate lavender cake, I’d love to hear about it in the comments below or via social media. Do share photos on your preferred social media site and use the hashtag #tinandthyme, so I can spot them. For more delicious and nutritious recipes, follow me on Twitter, Facebook, Instagram or Pinterest. Chocolate Lavender Cake. PIN IT. 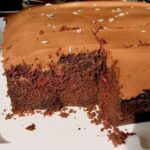 Produces a luscious and deep chocolate cake with a hint of lavender that's perfect for feeding a crowd. It's topped with a chocolate yoghurt icing which sets it off very nicely. Put the lavender buds into a teapot and pour over 440ml boiling water. Leave to infuse for 1 hour. Strain off and heat in a pan to near boiling. Break the chocolate into a bowl then pour the hot lavender water over it. Leave for a few minutes to melt then stir until smooth. Sift together the flours, bicarb of soda, cocoa and salt. Beat in the eggs alternately with the flour mixture. Stir in the chocolate ganache until thoroughly mixed. Spoon mixture into a lined 9″ (23cm) square deep cake tin or silicone mould and bake for about 40 mins at 180℃ (350℉, Gas 4) or until an inserted skewer comes out more or less clean. Leave to cool a little then turn out onto a wire rack to cool completely. Melt the chocolate, butter and golden syrup in a large pan. Leave to cool slightly. Stir in the yogurt until thoroughly combined. Spread over the cooled cake. Scatter a few dried lavender buds over the top if liked. It looks really fabulous! I want some right now. It is always like that when I visit your blog. I have given you an award. Come over and collect it. that looks fab, I must pass the recipe to my mother. She has a huge lavender bush and is always wondering what to do with it. Making cake would appeal to her. Mummy brain strikes again! I had you both in mind to give the award to. I probably got distracted while I was writing it up.I am adding you back on now! Forgive me? What an interesting cake – can you use any lavendar or does it have to be culinary lavendar? That was a fantastic idea and a lavender cake certainly appeals to me. Hope the course was as good as the cake. Oh I love lavender. I have a ton of it in the yard and am always looking for ideas. I am going to give this a try! Chocolate and lavender sound interesing. It looks really good! Jacqueline – thanks for thinking of me and saying nice things about my blog. Janice – just warn your mother not to put too much lavender in. I think I got it right for this one, but it is quite a powerful flavour. Chele – surely worth a try. Celia – thank you for the idea. Caked Crusader – I would have thought you could use any lavender. I used some of the lavender from my garden which I’d dried last year and used that. Kath – thank you. The course was fantastic. I was very lucky in getting an excellent herbalist and I think everyone had fun as well as learning a lot and taking away a load of balms, creams and teas that we’d made. Astra Libris – thank you. I do mostly try for healthy recipes and hope that the sugar is mitigated by the other good ingredients used!!!!! Vanessa – look forward to seeing your version at some point. Nicisme – I thought it was a good flavour combination and definitely worth a try – at least once! Thank you for commenting on Linden Grove. You have a great blog here. I will come back and try out some of your lovely chocolatey recipes! It looks amazing – really moist and generally gorgeous! I’ve tried baking with lavender before and quite liked it. It got a mixed reception when offered to other people – I’m pleased to hear all your course participants enjoyed it! I have a jar of dried lavender from the allotment but so far have only added it to quince jelly. Your cake looks delicious and sounds like you struck the right delicate balance. I bet it would be good with white chocolate. Loving this recipe so much that I want to make it right now, but am poorly. I was thinking along the same lines as Nic with white choc as that would be my husbands preference (funny how our minds work). I so wish I was on that herbal course: so that I could eat some of that cake and two learn much more about herbal medicine. Its great that its finally happening. I really do enjoy your blog, and apologise for not often commenting on it, but please be assure I do read it. Warmest of wishes. Simone – thank you and would love to hear back from you if ever you do get around to making anything from my blog. It’s always interesting to see how others fare. C – thank you. I guess a herbal course was a good place to get a good reception for this sort of thing. Nic – yeah, the lavender would be a good foil for the sweetness of the white chocolate. Are you going to give it a go? Tagskie – hello. Hope you enjoyed your visit. Mangocheeks – hope you are on the mend. Thank you for nice comments about my blog – it’s great to hear from you but please don’t feel pressurised to leave comments. I know I’m finding it rather hard to keep up these days. Agree with you and Nic about white chocolate. The course was really good – it was only an introduction but so much to learn! Astra Libris – are you going to write it? Lovely cake – I have never used duck eggs in a cake recipe before. I too am on the fence when it comes to using lavender. I love the addition of lavender in chocolate. Everything you make just looks heavenly! Margaret – duck eggs work really well in cakes – the yolks are larger in proportion to the white than in chicken eggs – do give them a try if you get the chance. Anne – I can quite understand why lavender might not be to everyone’s taste. Thank you Bridgett – if I took photography seriously, things would look even better. Choclette: This looks great. I am plucking up the courage to try some lavender flavour in food this Summer. I keep seeing some great sounding recipes like yours. It is interesting that you infused the lavender instead of drying, grinding and adding it as a powder. Hopeeternal – oh do give it a try – just don’t be heavy handed with it. I think you can use Lavender in several ways. As you say grind up dried lavender, make an infusion of it in water or milk or leave lavender flowers in sugar as you would vanilla. Didn’t know about the potential hazards to pregnant women – thank you for that.